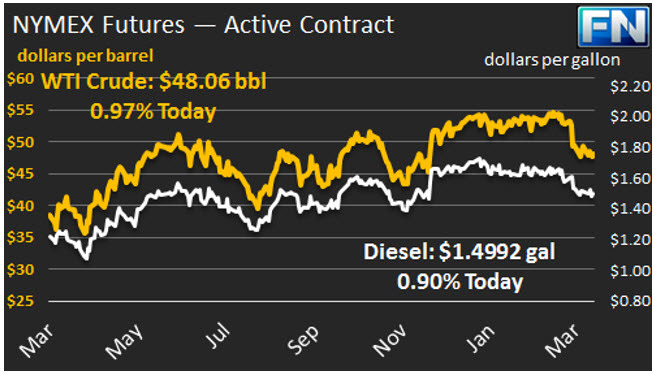 WTI crude prices are back above $48/b this morning, though prices are trending back down. 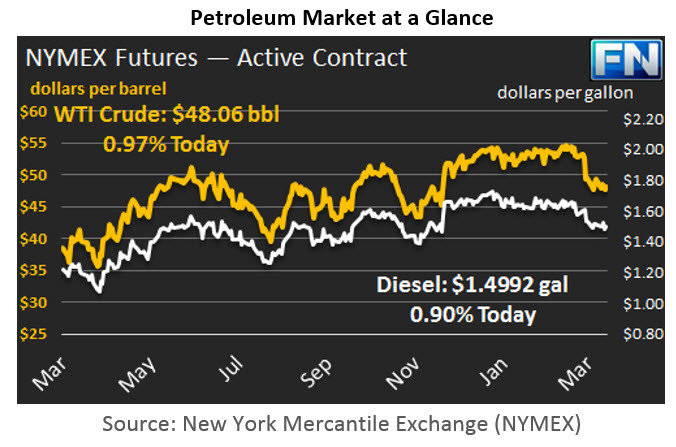 Yesterday, prices were mainly in the vicinity of $47.50/b, recovering above $48/b as the session went on. WTI prices opened at $48.15/b today, just one penny below yesterday’s opening. Since then, prices have weakened. WTI prices are $48.06/b currently, still up $0.02/b today. Diesel opened at $1.4997/gallon in today’s session. This was a slight decrease of 0.28 cents (0.19%) from yesterday’s opening price. Current prices are $1.4992/gallon, a small increase of 0.24 cents since yesterday’s close. Gasoline opened at $1.6019/gallon today, down 0.93 cents, or 0.58%, from yesterday’s opening. Prices are $1.5909/gallon currently, down 1.1 cents since yesterday’s close. The issue of stockpiles has kept prices down again this week. The EIA reported that crude stocks rose once again this past week, increasing by 4.954 mmbbls to bring the total inventory to 533.1 mmbbls. This build was higher than earlier estimates by Schneider Electric and the API. Gasoline and diesel inventories declined, however, partly offsetting the impact of the crude build. Gasoline stocks were drawn down by 2.811 mmbbls, and diesel inventories were drawn down by 1.91 mmbbls. The inventory movements are normal for the time of year, with many refineries going into and emerging from spring maintenance. Crude inventories tend to move up, and product inventories tend to be drawn down. This year, however, the crude inventories are at record-high levels already, and U.S. crude production is continuing to rise. A sale of crude from the U.S. Strategic Petroleum Reserve (SPR) will add another 10 million barrels of sour crude to the market in the second quarter. Our second article discusses the rise in commercial crude inventories and the fall in the SPR level. Previous ArticleU.S. Commercial Crude Stockpiles Rise while the SPR Level Falls.